The biggest single payout in sporting history went a boxer who didn't even win the bout. 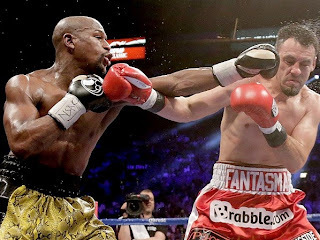 But earning a whopping $52 million didn't come easy for Oscar De La Hoya: he had to go 12 rounds with fearsome Floyd Mayweather, only to lose on a split decision. When the two pugilists pounded on each other in Las Vegas back in 2007, the fight set a record for the time by generating over $130 million in pay-per-view income, plus another $19 million in live ticket sales. De La Hoya didn't take home the belt, but he still pocketed the lion's share of the winnings. Mayweather, meanwhile, walked off with $25 million.